We were excited that the once-acclaimed Zaika had been “revamped, refurbished and reimagined” and finally relaunched around 3-4 months ago — and so all the more disappointed when our overpriced meal turned out to be incompetently cooked. Very surprising, given the restaurant’s pedigree and other critics’ effusive praise. First established in Chelsea over 15 years ago, Zaika has had more ups and downs than a yo-yo on a trampoline. 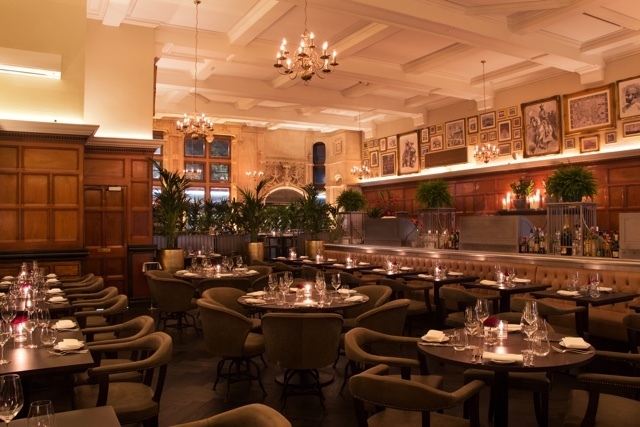 It’s where top Indian chef Vineet Bhatia (who went on to open the award-garlanded Rasoi in Chelsea) first made his mark, and it was one of the first Indian restaurants ever to gain a Michelin star. Many affluent Indians, proud that their complex cuisine had finally been recognised beyond the curry-house cliché, flocked there in their finery to celebrate special occasions. It spawned numerous Indian restaurants up and down the country copying the word ‘Zaika’ – which means ‘sophisticated flavours’ – into their names, and its chocolate samosa became one of London’s most widely imitated restaurant desserts. But when the restaurant lost its star, the Tamarind Collection, owners of Tamarind and Imli Street restaurants, took over and a couple of years ago inexplicably turned it into an Italian restaurant named One Kensington. It didn’t work and eventually closed, leading us to the rebooted Zaika of Kensington at the end of last year. 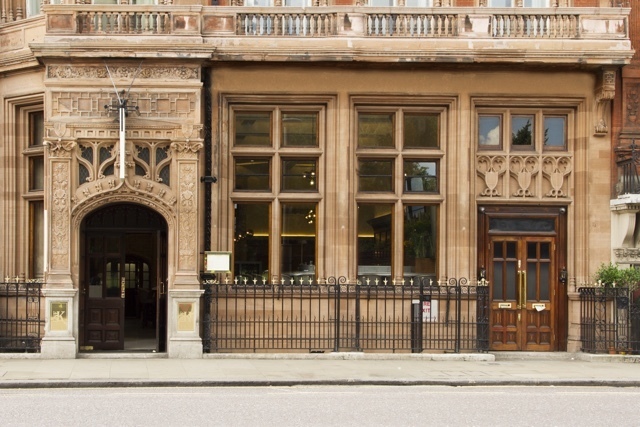 The 19th century Grade II listed building, formerly a bank, is certainly impressive, and retains many of the original architectural features such as high vaulted ceilings. Whereas once the bar was located by the entrance, it’s now plonked right in the middle of the room, with informal seating and a more formal dining area squeezed to either side. You can just drop by for a drink – and the cocktails are truly fabulous – but the bar’s unusually prominent positioning makes us question how serious the kitchen’s intentions are. Is Zaika now supposed to be more a drinking or a dining destination? It is a handsome-looking space though, all creams and browns and luxuriant with sturdy wooden panels, leather banquettes and dozens of framed pictures. Splashes of fresh flowers and plants bring tropical colour and feel, but the sparkling jewel-hued lamps have been replaced by more functional spotlights. If colonial India had gentlemen’s clubs, they would probably have looked like this. The kitchen is now overseen by Mumbai-born executive chef Sanjay Gaur, who’s trained as a pastry chef and worked at The Savoy Grill, Maze, and Angela Hartnett’s Murano among others. The head chef Devshanker Sharma has worked with the Tamarind Collection for over a decade. The menu is a contemporary take on Awadhi cuisine of Lucknow, the capital of the state of Uttar Pradesh in northern India. This intricate cooking style evolved in the royal kitchens during the Mughal Empire. It’s renowned for its refined, nuanced flavours and highly sophisticated techniques influenced by the cuisines of Persia, Turkey, Afghanistan and, to some extent, the Balkans and Central Asia. So we were surprised that there was nothing royal or refined about the vegetarian dishes on our visit. Mixed sprout tikki – spiced Indian potato cakes with sprouted beans – have no discernible flavour or texture of the sprouts, and we can’t see or taste their apricot-coriander stuffing. They’re over-cooked to the point of almost being burnt on both sides. 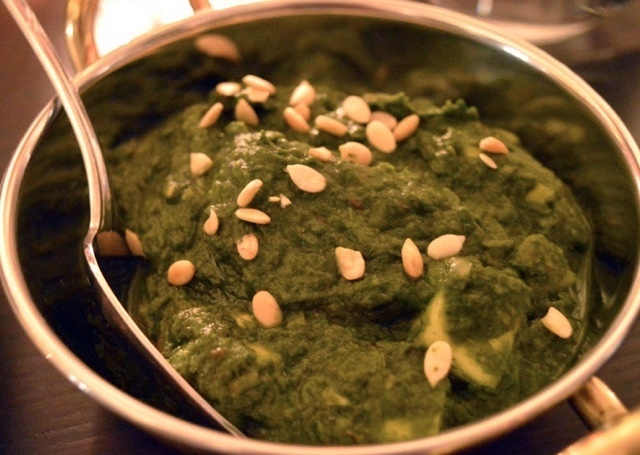 Palak paneer (spinach with Indian cheese), on the other hand, is alarmingly undercooked and has an unusually bright green colour and dominant taste of raw garlic. It’s described on the menu as ‘paneer tossed with onion-tomato masala finished with pureed spinach’ – and if you take the description of the cooking process literally, maybe that’s the problem. The curry should be made by frying the onion-tomato masala long enough to give it a rounded, well-cooked taste, adding minced spinach and cooking it further until it acquires a dark khaki-green colour. Sautéing onions, tomatoes and spices patiently for the correct length of time is absolutely essential in Indian curries, otherwise they just won’t taste right – and this popular Punjabi staple, which even many high street restaurants are proficient at, clearly hasn’t been cooked through. Indian baby aubergines are often astringent, depending on the variety used – and unfortunately this is the case with baigan masala here. The ‘masala’ is fine, but the bitterness of the ‘baigan’ doesn’t do it justice – though this is not really the kitchen’s fault. 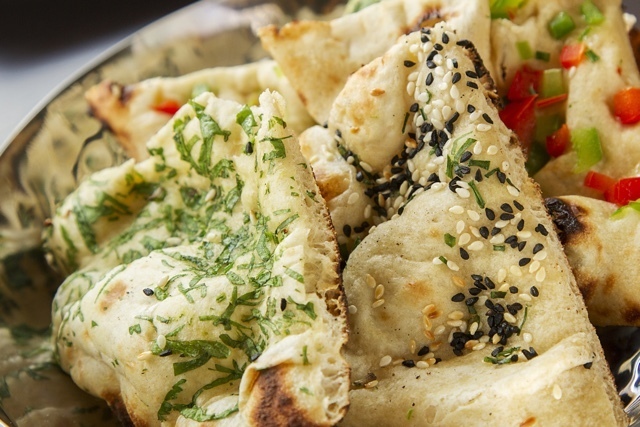 A bread basket is filled with soft plain and chilli-and-cheese stuffed naans, which are fine, but also paratha (flatbread) that’s overcooked to the point of being crisp and dry in texture. Alas the chocolate samosa hasn’t made a comeback on the dessert menu, but we like the baroque charms of the extravagantly decorated ‘cassata landscape’, featuring a medley of meringues with mango, raspberry and pistachio ice creams. Another dessert described as ‘chocolate bounty bar’ isn’t a version of the branded variety: its somewhat gimmicky name simply refers to its chocolate-coconut combo. The addition of nougat, apricot and popcorn lifts it beyond the realm of commercial confectionery – but only just. Service is slick, and the lovely staff were happy to push two tables together to create more space for two of us even on a busy evening. And bustling and lively it certainly is – though this could be part of the problem. Located near the Kensington Palace and Gardens, Hyde Park, Royal Albert Hall and a few 5-star hotels, the restaurant was filled with wealthy tourists on our visit – so perhaps the kitchen was aiming to please them. Or maybe the chefs were having an off night; or the vegetarian dishes are simply not on a par with omnivore critics’ meatier choices. Whatever, at £150 for a 3-course dinner for two – including two cocktails, two glasses of wine, a bottle of water and service – we’re not in a rush to go back and give it another chance. Zaika of Kensington, 1 Kensington High Street, W8 5NP. Tel: 020 7795 6533.